Mt Edith Cavell and Edith Cavell Lake, Jasper National Park, Alberta, Canada. Mt. Edith Cavell, Jasper National Park, Canada. 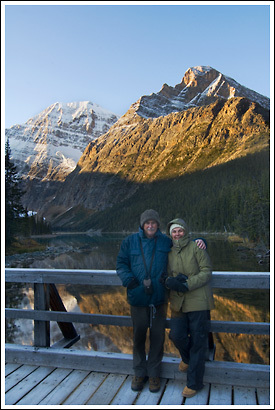 2 tourists (my parents) enjoying the cold morning dawn on the bridge at Lake Edith Cavell, in front of Mt. Edith Cavell, jasper National Park, Alberta, Canada.